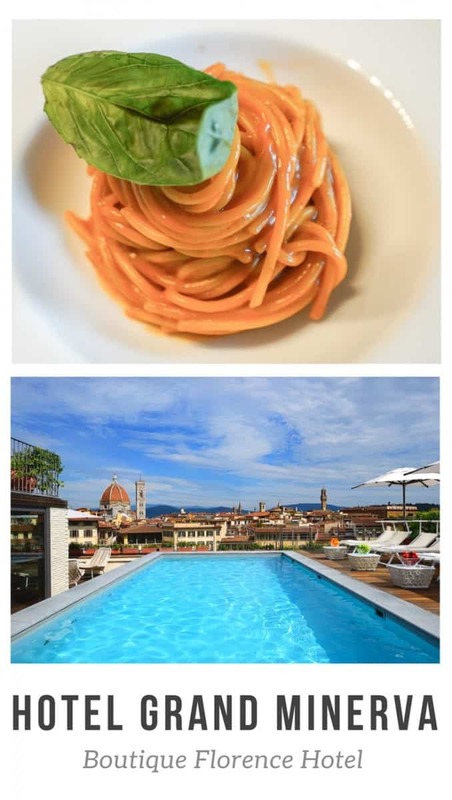 Families traveling to Florence have found Hotel Grand Minerva, a boutique 4-star hotel with a rooftop pool, outstanding restaurant, and comfortable rooms that sleep four or five. Hotel Grand Minerva is located steps from the train station, which is almost problematic in that it’s too close to take a taxi but can still be a far walk if you too many kids and bags to carry. It’s definitely within walking distance for families who pack lightly with suitcases they can easily pull. 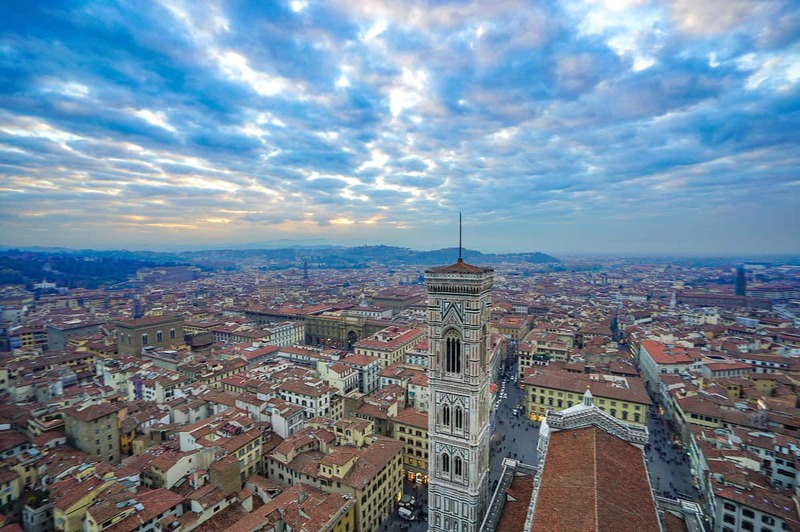 The hotel is situated next to Santa Maria Novella, as much as an active church today as it holds nearly every early Renaissance master. Masaccio, Brunelleschi, Ghirlandaio, Ghiberti, Botticelli, Filippino Lippi, and Uccello all have works inside. 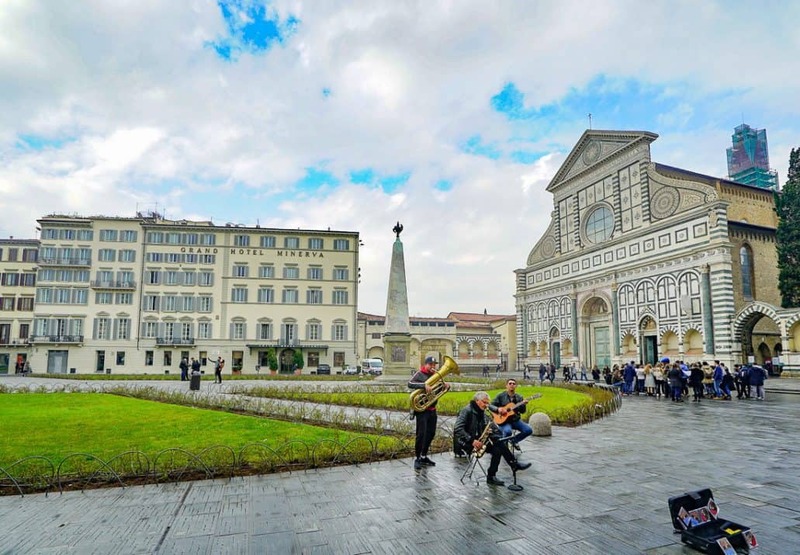 The Piazza Santa Maria Novella is not one of the busier and noisy piazzas located in Florence like the Piazza della Repubblica can be, so the hotel’s perfect location feels as peaceful as it is convenient. The Arno felt like a six-minute walk away. Most of the main tourist attractions were less than a 15-minute walk. A taxi stand was in the middle of the piazza, and the staff at the front desk would phone us a taxi that always took two minutes to arrive. 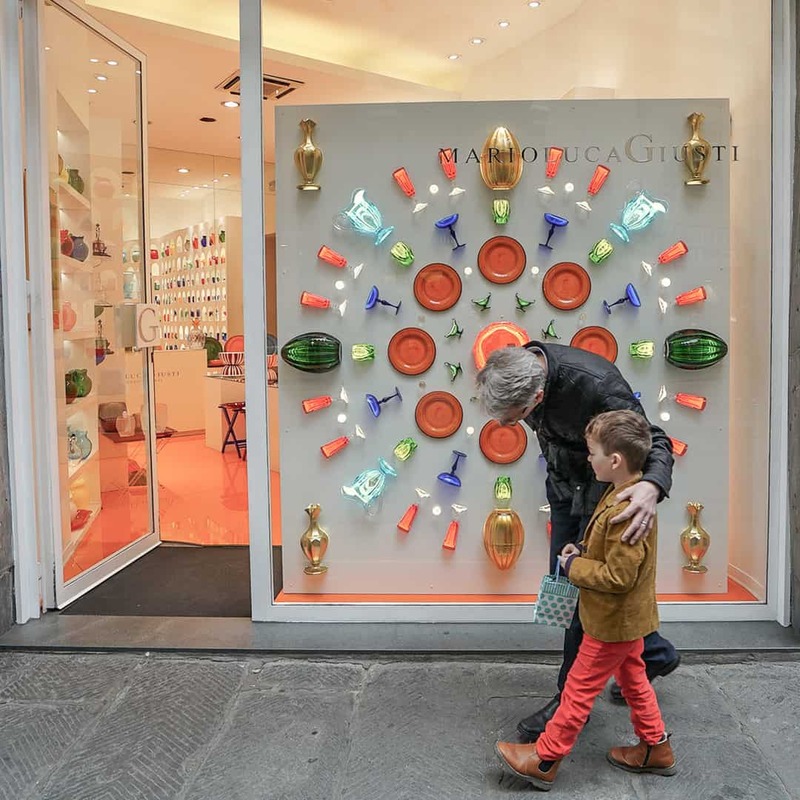 Guests can reach the Arno in a pleasant six-minute walk. Historically, the Piazza used to host an annual chariot horse race, the palio dei Cocchi. This tradition started in 1563 by the Grand Duke, Cosimo de’ Medici and continued until the middle of the nineteenth century. The obelisks outside the hotel (which you can see in the first photograph) stand to mark the routes where the chariots were to turn. The lobby and lounge areas of the Hotel Grand Minerva show its boutique hotel personality. 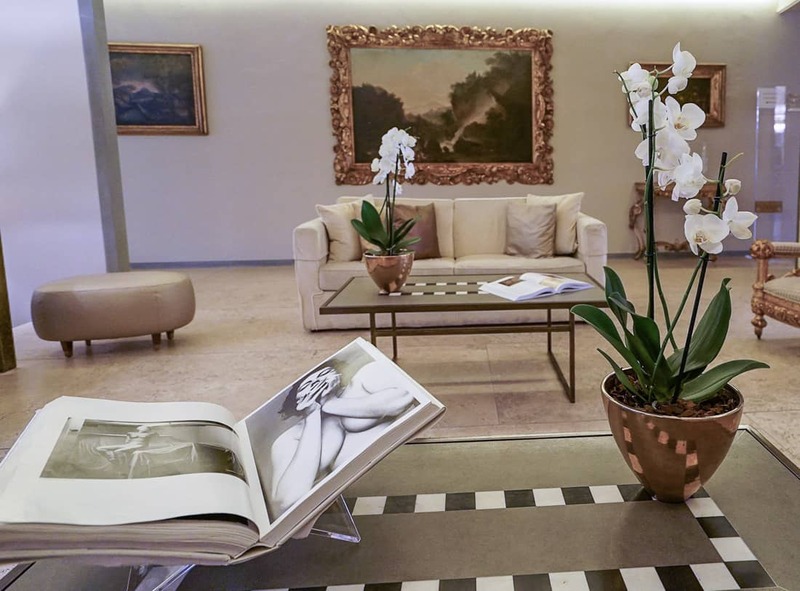 Every coffee table displayed art books and the walls adorned with classic Italian art. Filippo Burroni, the general manager, is seen every where assuring things are in order. My children were offered lollipops at reception. 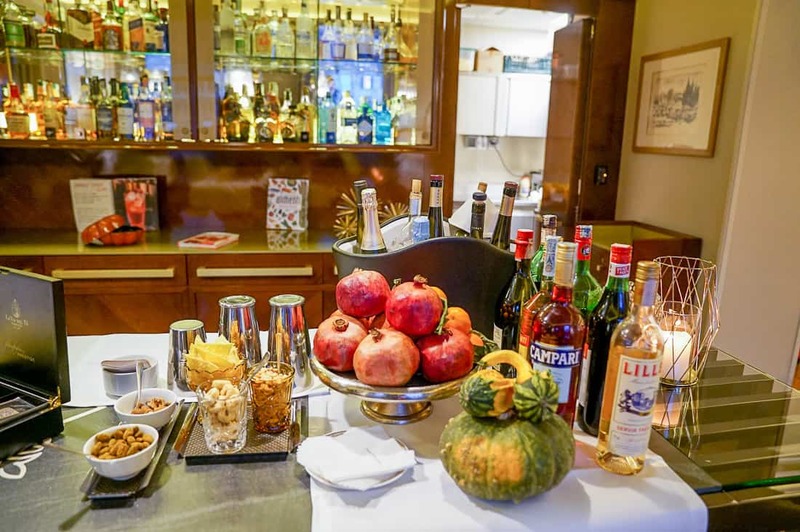 The bar offered an extensive selection of snacks, wines, and cocktails that transitioned from sweet to savory as the afternoon became night. Hotel Grand Minerva Bar and Lounge for wines, cocktails, and appertifs. 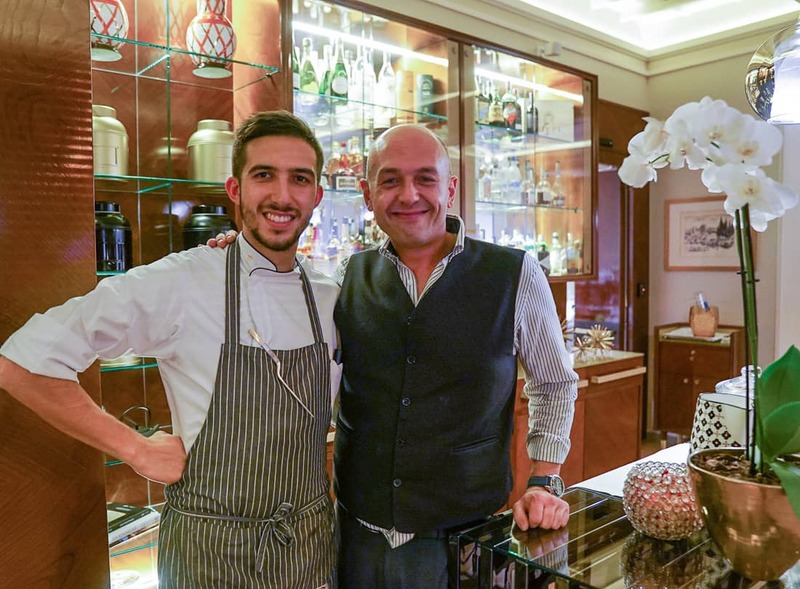 Foodies heading to Florence, Italy might overlook a smaller hotel restaurant, but it would be a grave mistake to miss out on Hotel Grand Minerva for dinner. La Buona Novella was in a league of its own, and the only place I would recommend returning. It’s small and intimate and led by very young daring chef, Tommaso Calonaci, who takes lots of creative risks to his diners’ benefit. My amuse bouche of a puree of potatoes, sea weed and green apple salad was just a teaser of the ambitious mix of flavors to come. The entree was the most delicious white fish similar to a Dorado steamed in a coconut milk and white wine broth in a cast iron pot. When Jonas lifted the lid, the aroma was outstanding. I actually fanned it toward my face to breathe it all in. Desserts were equally interesting. I loved the fun gin and tonic fused granita served with blackberry sorbet. 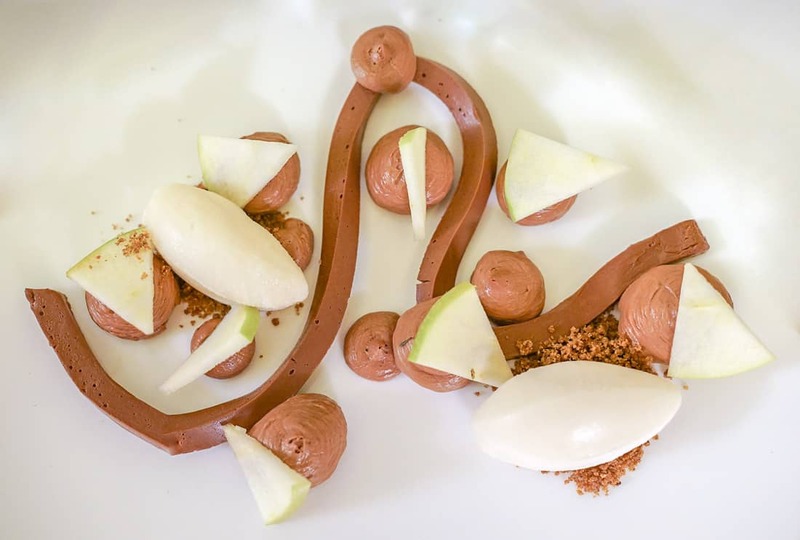 The showcase was something the Tomasso called “Flexible Chocolate.” The fudge like consistency made a swirling snake on the plate between mounds of chocolate mousse, slices of granny Smith apples, and a potent beer ice cream. Given the size of the restaurant, I would definitely book a table in advance of your stay for dinner. Lunches were more casual offerings like spaghetti Pomodoro and Caesar salads, but made flawlessly. Flexible Chocolate dessert at the hotel restaurant La Buona Novella. The breakfast buffet, included in the price of the room, was excellent, as were the servers ready to offer the most delicious cappuccinos and espressos. Even though their English was minimal, they understood all of the requests I couldn’t ask in Italian, and we looked forward to our breakfast every morning. The spread included several stations of fresh fruit, pastries, warm dishes, cereals, and charcuterie. The dining room was incredibly elegant, too, in a Tiffany blue, and it felt very much like a five-star hotel’s breakfast. 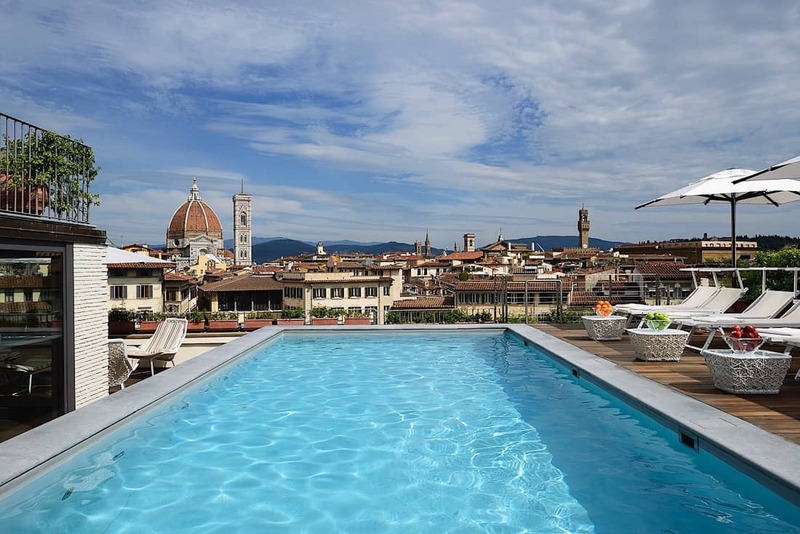 The biggest attraction of the hotel is, of course, a lovely rooftop pool with sparkling view of Florence, the Santa Maria Novella and the Duomo. 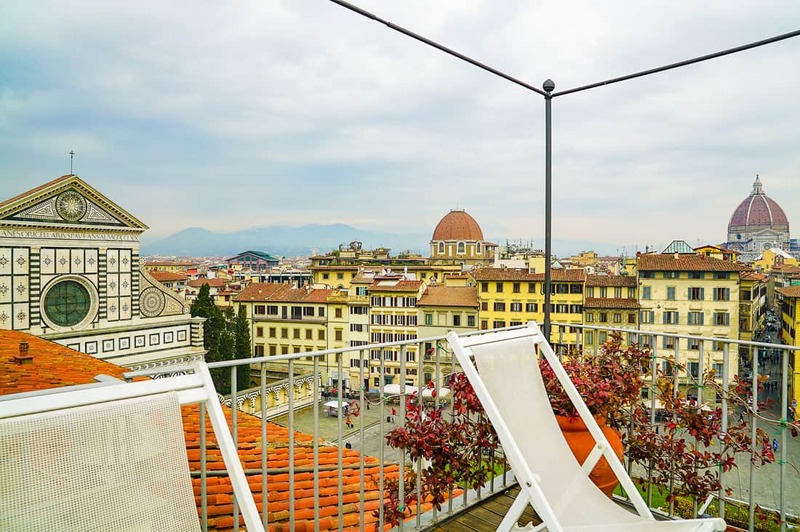 If your visit is during the summer, you’ll feel like you’re at one of the best places to be in Florence with its panoramic views. The rooftop hotel pool is incredible from May through September. Photo courtesy of the hotel. The pool is open for guests only from May to September, from 9:00 am to 7:00 pm. There is also a snack bar and lounge on the roof. The hotel offers an indoor caldarium, a term for a hot spring Roman bath. Nowadays a large Jacuzzi hot tub replaces hot springs. Four people can enjoy the hot tub and wet areas for 100 Euros for the hour for exclusive use. Children are allowed when accompanied by an adult. Having exclusive use of this space is a great way to wind down at night after a day of exploring outside of the pool’s season. 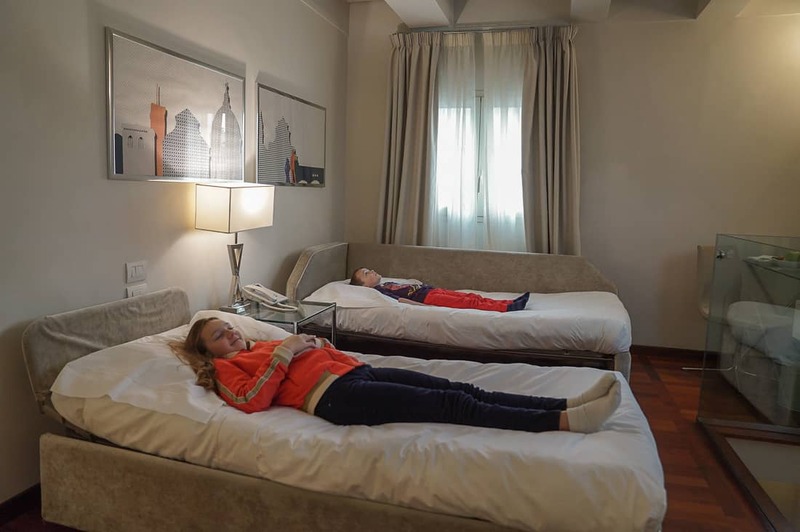 I chose the Hotel Grand Minerva for its many family-friendly rooms with bed configurations for four, and I liked the way the rooms looked on the website. But this was my first experience in my travels where the room I was given looked nothing like the website photographs. A daybed with a trundle was already made up for both children that dominated much of the living room. It’s not so much the tight squeeze, it was that it had a very institutional feel. Aside from two pictures, empty walls and shelves felt like the room had been robbed just before we got there. 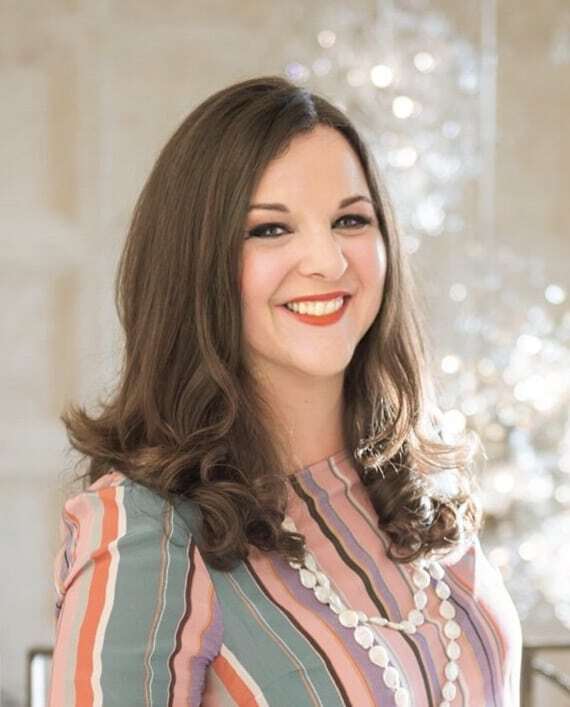 Because of so little décor, I couldn’t help feeling that a family room was code for remove anything that could break as if four three-year-olds were checking in. Despite its lackluster design, the room still offered a comfortable night of sleep for our family. It served as a good place to rest in between extensive days of sightseeing. When I inquired at the front desk about this, I asked what room categories were shown for families on the website. Avoid the rooms classified as “family rooms” if room design matters to you. I loved everything else about this hotel, so if I were to return, I would request any of their beautiful suites, some even with exposed frescoes, if a queen and a sofa bed will accommodate your family. But maybe you travel with triplet three-year-olds, and this is perfect for you. 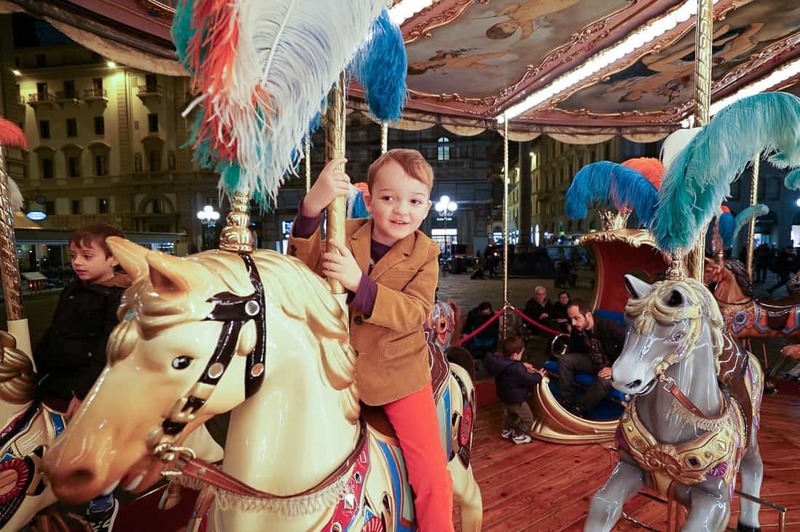 The carousel in the Piazza della Repubblica proved to be bittersweet. Our older daughter, just days before her twelfth birthday, snubbed the idea of riding the carousel with her brother. For the first time, she opted to sit out from a merry go round, and a family chapter closed while a new one began, reminding me of the scene in Inside Out where Goofball Island collapses inside the head of the tween protagonist, Riley. My gluten-free husband fell in love with the gluten free pizza at Ciro & Sons. We spent a long time talking with the family who owns the restaurant. An American woman married one of the sons and suffers from Celiac disease, so they have mastered the perfect gluten-free wood fired pizza crust over the years. My husband asked for a second pizza as dessert on the following night. They sell their crust mix, and I was a fool not to buy it. 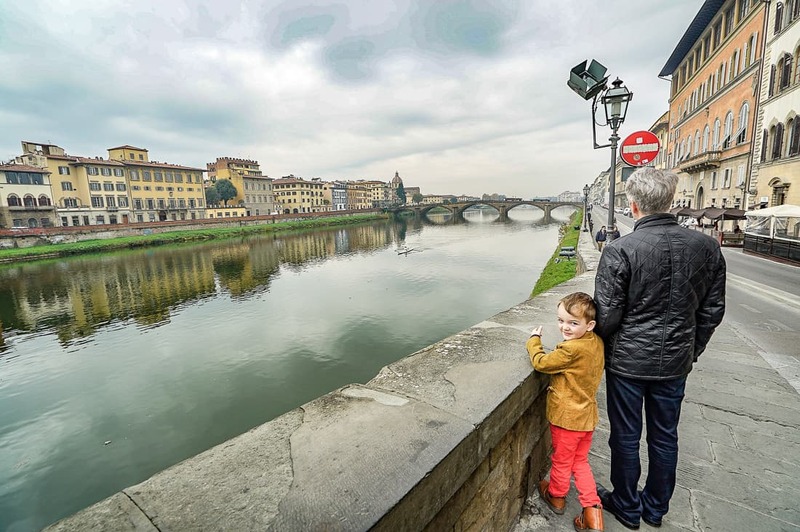 Read about our city tour and Uffizi scavenger hunt, the absolute best part of our visit in Florence. We used LivItaly Tours for their private guide who was great with kids. We tried a pizza and gelato making class, too, but it wasn’t as good. Learn which neighborhood gelateria served us the best ice cream, too! Although we were guests of the Hotel Grand Minerva, these opinions are my own. 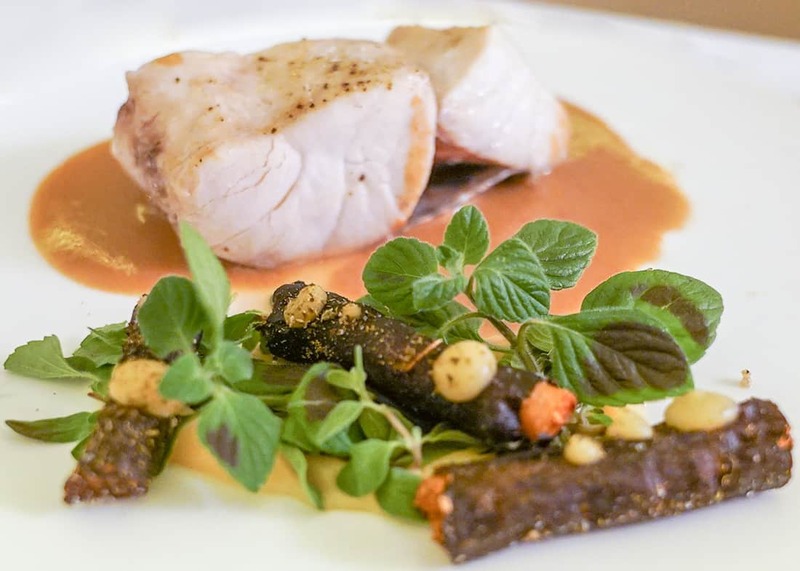 Oh Just wow, what beautiful photos of the food and the hotel. And thanks for the tips on the rooms to choose when traveling with family! What a luxurious place! This looks like an amazing pick for families who like nice places.